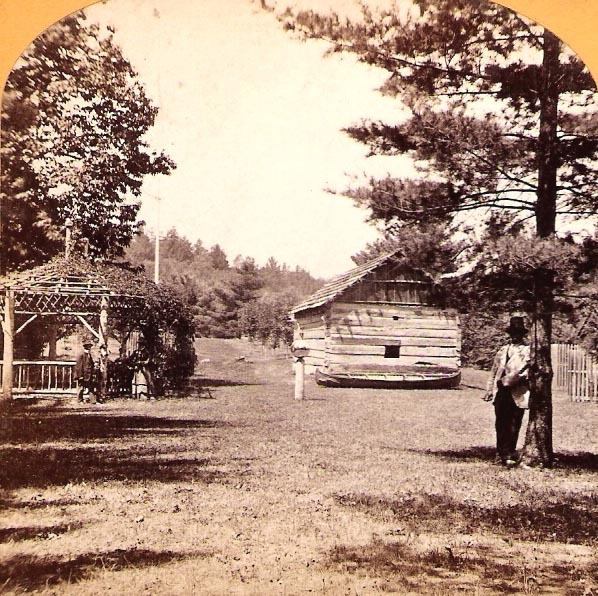 "774.-Indian Council House Grounds, Portage, N.Y."
This interesting view was taken from the east end of the Council Grounds, looking west toward what would be the modern parking lot. The Council House, moved from Caneadea and carefully restored, is visible right center, with Mr. Letchworth's Indian Canoe resting on the ground nearby. The rustic arbor (see another view) and the reflection globe can also be seen. It is difficult to tie down the exact date. The arbor, as well as the additional plantings beyond the Council Ground indicate that a few years has past since the Grounds first opened. Although we have indicated that the image dates from around 1880, it may be a few years earlier. For an earlier view taken from a similar vantage point, see image 196. See a modern photograph taken of this scene. We thank Karen Gibson for sharing this wonderful image with us!